Steel Partners Foundation was formed in 2001 by Warren Lichtenstein, founder and executive chairman of Steel Partners Holdings L.P. (NYSE: SPLP). Mr. Lichtenstein created Steel Partners Foundation as a way to support philanthropic causes that are close to his heart. As a proud father of two children, he wanted to make a significant impact within the communities where he and his family lives and works, with an emphasis on causes related to children, education and sports. A conference coming to Kentucky in October will bring alienated parents, grandparents and experts in the field together for presentations and discussions on the growing issue of parental and family alienation. 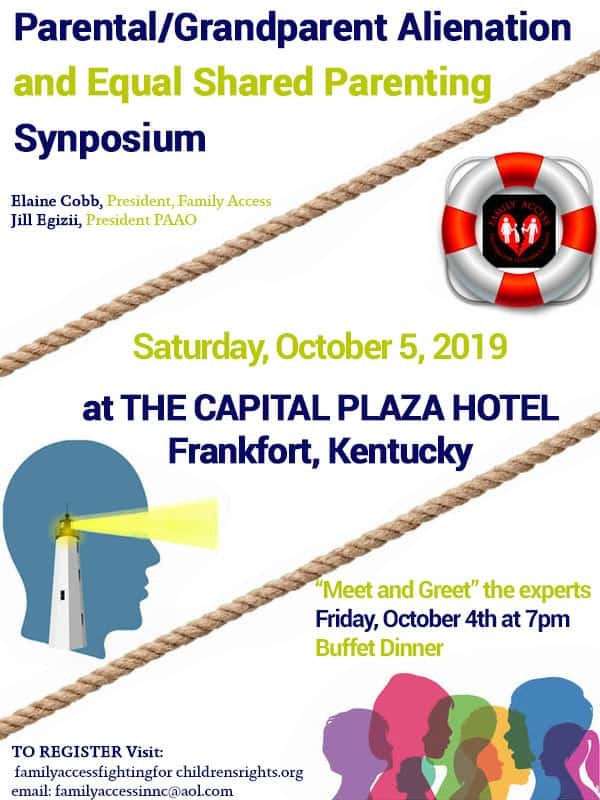 The Parental / Grandparent Alienation and Equal Shared Parenting Symposium, hosted by Family Access – Fighting for Children’s Rights, will be held Saturday, Oct. 5th, 2019 at the Capital Plaza Hotel in Frankfort, Kentucky. An opportunity to meet the experts who will be speaking during the event will take place the evening before, Oct. 4th, at a buffet dinner.